While on the road not long ago, promoting my work down in the south, in the Bible Belt, I stopped in at a print shop to see about having a promotional page about the Malcolm Clay Trilogy printed. A middle aged black woman helped me. She was short, round, and seemed a bit grumpy, so I treated her in a quiet, respectful manner. "When do you need these?" she asked, as if burdened with an overload of work. "When can you have them?" "Tomorrow after four," she tested. "Tomorrow after four it is." She phoned the next day at two-thirty. The order was ready, so I drove right over. 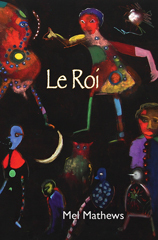 I had a review copy of LeRoi with me, so I brought it along. After paying for the copy order, I asked, "Do you read much?" She hesitated and then answered, "I like to read, but don’t have much opportunity because I work full time and take two classes a semester at the college." "Business, accounting. You know, I can't make the kind of money I need to make working at a place like this." "Yeah, I suppose so, but you seem to be good at what you do," I answered and then handed her the review copy and suggested she check it out in her free time. She graciously thanked me and we went our separate ways. A couple of days later, I phoned her, wanting to know if she could print more copies, real quick this time. "Sure, bring 'em in right away. They'll be done in thirty minutes." "OK, I’ll be right there." "And that book you gave me… I’m gonna tell you about that book!" "What, you don’t like it?" "That’s some good reading, but I don’t like it and I’m gonna tell you why when you get here!" "Ho, ho, I had a feeling this was gonna happen!" I laughed. "Yeah, you had a feelin' and now you’re gonna hear about it. Come on now!" I showed up ten-minutes later, still a bit nervous, too. I’m a grown man and for the most part say what I please whether it offends others, or not. But something had me. I really liked this woman, but for some reason, I was afraid of her, too. There was this Great Mother quality about her, something that caused a piece of me to fear this dark goddess. There she was, the Black Madonna standing at the counter, all puffed up and waiting to have a shot at me just as soon as I walked in. "Alright, I'm here for my medicine," I nervously chuckled. "You’re here for your medicine, huh? It’s about time! Boy, who wrote that book? Did you write that book?" I shook my head, no, feeling just like some teenage boy who'd been caught spray-painting graffiti on the school's bathroom wall. "You sure you didn’t write that book?" she asked. Hell, she knew I wrote the book. My photo was on the back cover. "No, but I can pass a message on to the author, if you like." I suggested. "You tell him that that's some good reading, but the profanity… he can't be using that kind of language. No sir…"
"Oh, come on now, it's not that bad…"
"Not that bad? Mister, I'm telling you, the F word… the most you should say in that book is damn," she squealed. A few people were now standing in line behind me, and a few others were just to my side waiting for their copy orders. In other words, the Great Mother had an audience. I looked over to the onlookers with a sheepish grin, then back to the boss lady and said. "OK, so you want me to tell the author that you don’t like LeRoi because he uses too much profanity and the worst word he should use is damn. Is there anything else?" "Now, I didn't say I don’t like the book. I told you, that's some damn good reading…"
"Look, you tell him that I'm a church-goin' woman and that all that profanity is just way too much." "Well, maybe we need to publish a church-goin' woman’s edition of LeRoi," I quipped as a few members in the audience laughed out loud. "Now you're talking! And the strongest word he can use is damn." "Well, what should he put in place of all those other four letter words? Don't you think it'll take the life out of the book?" "No, all he has to do is replace all that bleep-bleep language with those funny little symbols and squiggly lines." "OK, I’ll tell him that all the bleep-bleep language has to be changed to those funny little symbols and squiggly lines. But do you really think church goin' women will read a book like that? I mean, they know what those funny little symbols and squiggly things are all about. The profanity is still there, even though it's hidden." "You just tell him what I said. You tell him that a church-goin' woman says that all that bleep-bleep language needs to be changed to those funny little symbols and squiggly things." "And then you’ll recommend LeRoi to your church goin' women friends?" "Yes, sir, I most certainly will. I told you, it's some good readin'. I just don’t like all that bleep-bleep language." "OK, I’ll pass the word along," I answered and then thought to ask, "Oh, by the way, how far did you read?" "To the part where he had to tuck his tail and go back to ask the boss lady to rent him a room." "So, you liked it enough that you finished the first chapter?" "Oh, yeah. I told you..."
"That Malcolm Clay, he's an ornery buzzard, isn't he?" I grinned. "Yeah, he most certainly is." "He’s got a lot of learning to do, doesn't he?" "Yeah, he certainly does. And I have a feeling that he learns everything the hard way, too." "Yeah, you got a pretty good take on Malcolm…"
"Now, I've got to get back to work before I get in trouble around this place," she announced, looking up to wink at a co-worker who was standing behind a copy machine. "There, I got that one straightened out,” she proudly said, loud enough for her audience to hear. Once she had everyone's attention, she added, "I had to straighten that old man out this morning, now I got this fellow back on track, and I’d like to get one more before the day is done. I'm telling you, some of these people just don’t have a clue…"
For those who demand freedom as thier individual right! True this book takes you on a physical journey from California to Ireland via Switzerland, Italy, and France. However, if a potential reader quickly glancing over the back cover thinks this will be run of the mill - travel log kind of entertainment - beware. The cover may give a hint to some that this is more like a journey 'to hell and back', but that's putting it lightly. SamSara is not only a page-turner, but provides valuable insights into a very small part of mankind, those who do not fear Freedom but instead demand it as their individual right. 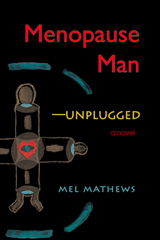 I found this novel to be a very unique action thriller, which takes place in a micro cosmos of one single person: Malcolm Clay. He takes the longest and most convoluted journey anyone could imagine. Malcolm is in my eyes a hero taking the terrible risk of traveling the uncharted regions of his own psyche, deep down to vast regions of fear and pain but also of brilliant revelations full of light and hope. SamSara portrays the struggles of a man searching for freedom from his puritanical upbringing and the existential traumas of his youth. Again and again, he comes up against dead-ends and frightening reminders of images from his past. His dream sequences are wonderfully portrayed. One in particular comes to mind, about tigers and how a number of these dangerous animals invade a house, and professionals are called to exterminate them. But instead of killing them, the tigers are tranquillized, and one realizes that the animals are symbolic of the sometimes overwhelming demons within us, energies that have to be subdued and sometimes even separated so that we can slowly develop a relationship and come to terms with these integral aspects of ourselves as opposed to denying their existence and continuing to suffer in a host of neurotic or even psychotic ways. 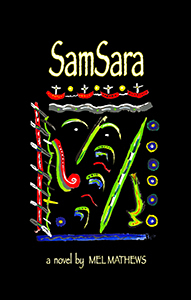 In my opinion, the very essence of SamSara is about the transformation of images, and Mel Mathews is quite masterful in the way he moves readers through this process, building to high points of interest and excitement, before letting off, allowing the reader time to relax and enjoy a more normal flow of life as these old ghost are slowly transformed into vital companions. I found it rewarding and enlightening to accompany Malcolm during his metamorphose from a person haunted by his past, yet willing to gamble not only his worldly goods, but even his soul, to become the individually decisive and free man he longs to be.